A lone horse saunters onto the sand-strewn stage under the 125-foot White Big Top at the edge of Toronto’s waterfront which opened to the public earlier this week. The animal is one of 72 steeds giving heft and direction to Odysseo, the second equine show created by Cirque du Soleil co-founder Normand Latourelle following the outstanding success of Cavalia in 2003. 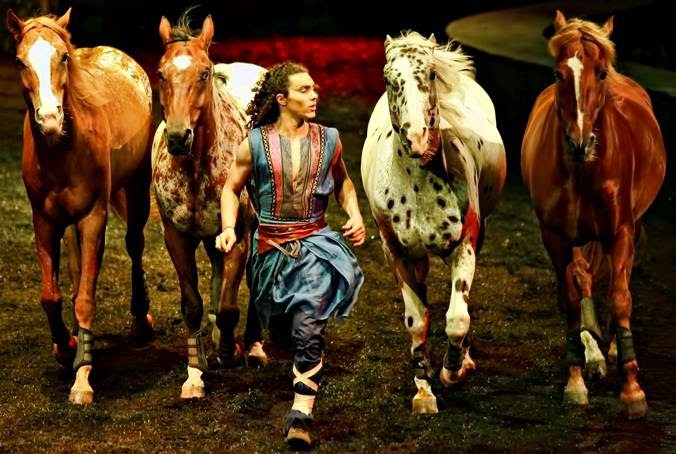 Like that first now internationally touring production, Odysseo uses horse power to drive its unique theatrical presentation into the stratosphere. Original music by composer Michel Cusson, a towering set design by Guillaume Lord, atmospheric lighting by Alain Lortie and large-scale video projection on a rear screen as big as three IMAX theatres combined, round out a theatrical production as transporting as it is awe-inspiring in its command and control of unbridled nature. This Quebec-made production, first unveiled in Toronto in 2012 and back in the city until May 10, gives new meaning to telling a tail. Fluidly structured with dazzling displays of daredevil prowess and syncopated movement sequences created by the show’s director and choreographer Wayne Fowkes in association with equestrian choreographer Benjamin Aillaud and dance choreographer Darren Charles among others, Odysseo is a spirited romp through time with a focus on the special relationship between humans and horses. It’s a partnership that jumps, soars, dances and kicks, imparting a powerful visceral experience for the viewer. The kinetic connection is softened by a strong emotional bond between trainer and animal. That lone horse at the show’s beginning is soon after joined by a stampeding herd, all stallions and geldings with an average age of nine years who are brought to heel by 40 skilled riders of various nationalities who mount them to perform stunts while saddled on their broad, muscular backs. 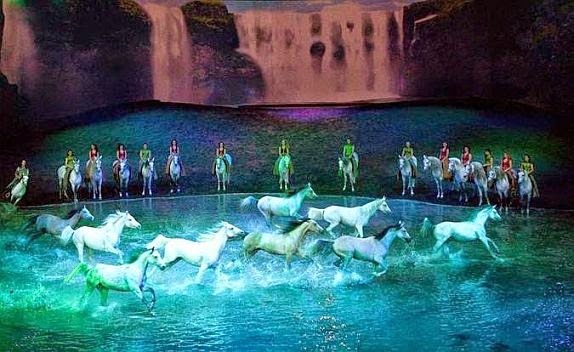 Riders flip, vault, hang and drag their bodies while their horses gallop beneath them; women in the cast, wearing the long, flowing costumes executed for them by Michèle Hamel after an original design by creative costume designer Georges Levesque (he passed away mere days before Odysseo’s world premiere in Laval, Que., in 2011) also stand astride two horses at a time, Roman style, elegantly gliding. The horse and the rider are as one. Aerial acrobatics spin on hoops and suspended overhead while on the ground, a large team of tumblers from the African nation of Guinea rival the horses in both speed and dexterity. It all makes for a visually dynamic presentation that runs riot through the heart and the imagination, completely and utterly engaging the senses while also rousing in the spectator ancestral memories of horses as humankind’s first helpmeets. 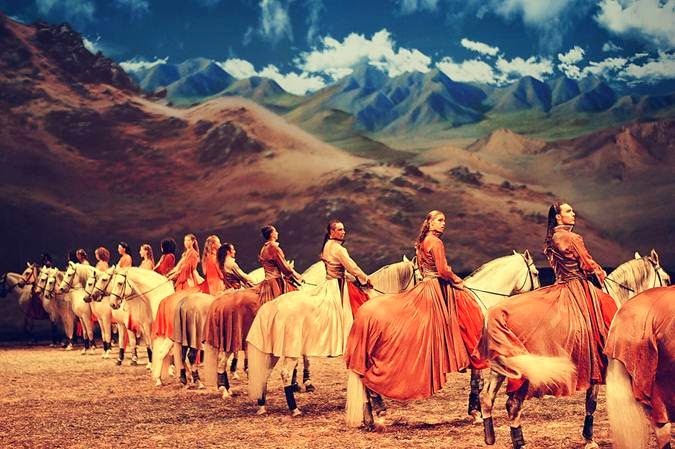 As Odysseo artistically reminds us, horses rode warriors into battle, they showcased the victors on parade, they helped till the soil and carry centuries of man-made weight. Cruelties as documented in such childhood books as Anna Sewell’s literary classic Black Beauty are edited out of Odysseo which elects to present the relationship between man and beast as a unique kinship, a bond cemented by mutual respect and love. This point of view is not sentimentalized. The horses are not beribboned and pompomed. Rather, they are presented more as four-legged peers, granted space large enough in which to express themselves naturally and forcefully as animals with an innate sense of drama. They are allowed to steal the show. On the night of the April 8 opening, one horse kept flashing his teeth at the 2,000 spectators in the audience, eliciting laughs. Another, a born prankster, nipped at the backs of his fellow steeds in full gallop; the same horse then took another horse’s place in a line-up, causing the more innocent one to look confused until a trainer found him his rightful place. These spontaneous moments, as amusing as they are, underscore just how precarious an undertaking Odysseo is. Animals, even ones as finely trained as these, are unpredictable. In Odysseo there is always awareness that with one false move a tragedy could occur. It’s part of the thrill, of course. There’s danger in the beauty. And that beauty remains a powerful draw. Representing a variety of breeds – Appaloosas and Arabians, Belgians and Canadians, Criollos and Lippizans, Oldenburgs and Spanish Purebreds among others – the horses are all magnificent creatures, wonderful to look at it, easy to adore. Their manes are long and kinked out by daily braiding; their different coloured coats are sleek and unblemished and their eyes large and bright. A rare peak backstage into their stalls finds them exquisitely pampered with delicately scented showers, deep tissue massage, and a consistent terroir diet of hay and oats imported from Quebec. It’s all part of making the animals feel comfortable, and also happy. Nowhere in the show is there a sense of the horses being exploited. In Odysseo, they are frequently encouraged to roam freely on a specially made stage made of sand combined with fibre to make it hard enough for them to run on. Adding to their sense of freedom is the set design which resembles a large open field with a rolling hill and a wide open sky that fills with birds, stars and monolithic images from Easter Island. It’s an illusion imparting a feeling of boundless energy, a hallmark of the show. Towards the end, the playing area fills with water, creating a glistening pool through which the horses run and splash. It’s an exhilarating image and it is preceded by a pretty equine ballet in which a steed and his lady rider are locked in a pas de deux inclusive of steps borrowed from the competitive world of dressage, among them piaffe (a trot in place), passage (a very elevated and cadenced trot), and collected and extended canters. Horse and human are here in complete step with each other, the product of great skill, discipline and years of specialized training. It’s a feat to behold and it speaks to Odysseo being an imaginary world where art and nature are tethered together to create the extraordinary. The horses here are not racing to finish. They run to inspire.